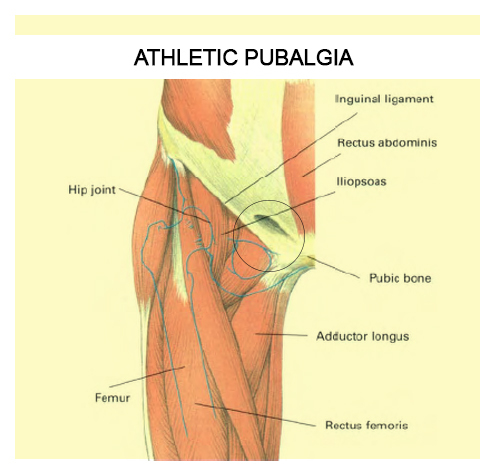 Athletic pubalgia is generally considered a chronic condition (long term and/or recurring) and is a result of repeated trauma or overuse of your groin area. It generally begins slowly as a result of inflexible, tight and eventually weakened and damaged hip flexor muscles (psoas major, iliacus, tensor fasciae latae) and inner thigh/groin muscles (adductors, sartorius, pectineus, gracilis) which bend your pelvis forward and stretch your lower abdominal muscles. Activities like hockey, soccer, tennis, distance running, football, rugby and track & field events promote this type of action. These activities also involve a lot of repeated twisting and turning. The combination of these movements promotes a force imbalance at your pubic bones and pubic symphysis (joint between the 2 pubic bones) that stress the posterior (back) wall of your inguinal canal (passage through your lower abdominal wall). This can cause a disruption of your inguinal canal and lead to weakened and torn abdominal muscles and tissues, in which your muscles, tendons and ligaments pull away from your pubic bone. Specific injuries range from a torn external or internal oblique muscle or conjoined tendon, to a loosened transversalis fascia, or a split between your conjoined tendon and inguinal ligament (among other injuries), an entrapment of the ilioinguinal or genitofemoral nerves will also often occur. Vigorous participation in the above sporting activities can overload the bones and tendons at your pubic symphysis and actually cause more than one groin injury at a time (for example osteitis pubis or adductor tendinopathy with athletic pubalgia). Men are 10 times more likely to experience athletic pubalgia than women, however women do get it. The most likely sufferers are “weekend warriors” who participate in strenuous activities during the weekend, however do not exercise regularly during the week (this can overwhelm and put stress on your body). Other factors that influence your risk of having athletic pubalgia are age-related weaknesses as a result of degeneration in your bones and muscles, previous surgery, obesity, and defects in your groin area from birth.